The DCP-8155DN is a high-speed laser multi-function copier ideal for businesses or small workgroups. 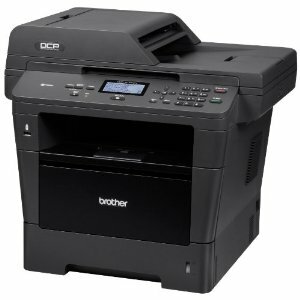 It combines reliable, monochrome printing and copying up to 40ppm, and color scanning. The DCP-8155DN also offers built-in networking and mobile device printing via: AirPrint, Google Cloud Print, Brother iPrint&Scan, and Cortado Workplace. It features automatic duplex (two-sided) printing and single-pass duplex copying/scanning. Plus, the DCP-8155DN offers a 300-sheet paper capacity, a legal-size document glass, a 50-page capacity automatic document feeder and a USB Direct Interface. A 3 year limited warranty+ (2 year exchange, 1 year depot) allows for worry free use. For lower running costs, a high-yield 8,000-page toner cartridge is available.